The Telescope, Observing, Sniper’s, C Mark I single draw, 25 Power (25X) was invented and manufactured by Research Enterprises Limited (R.E.L.) 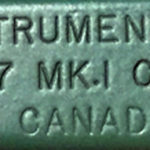 in Toronto, Ontario, Canada as a proposed replacement for the classic old British design Scout Regiment Telescope MK. IIs. Just over 500 sets were made in 1944 – 1945. The British advised Canada that they were not interested in the TOS C MK. 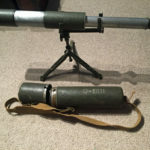 I as they were going to stop using telescopes for snipers and observers and as a result, lacking a foreign market, R.E.L. ceased production. Sadly, the British reneged on their word and continued to use the old fashioned 3-draw 20 power (20X) Scout Regiment Telescope MK. II until at least the mid-1990s. Telescope, Observing, Sniper’s C MK. 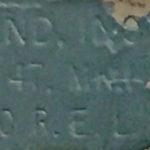 I Serial number 403-Cmade by Research Enterprises Limited in Ontario Canada. 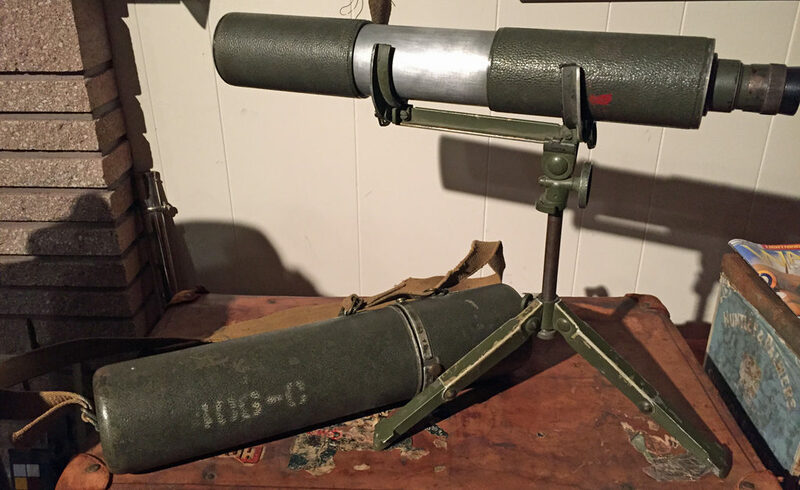 The scope is dated 1944 and the case is dated 1945. Telescope, Observing, Sniper’s C MK. I Serial number 403-C made by Research Enterprises Limited in Ontario Canada. 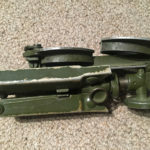 The scope is dated 1944 and the case is dated 1945. Telescope, Observing, Sniper’s C MK. I Serial number 403-C made by Research Enterprises Limited in Ontario, Canada. Closed position after removal from the carrying case. Telescope, Observing, Sniper’s C MK. I Serial number 403-Cmade by Research Enterprises Limited in Ontario, Canada. Sunshade in the extended position after removal from the carrying case. 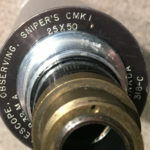 Eyepiece of the Telescope, Observing, Sniper’s C MK. I Serial number 403-Cmade by Research Enterprises Limited in Ontario, Canada. 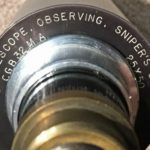 Telescope Observing Sniper’s C MK I markings “TELESCOPE, OBSERVING, SNIPER’S C MK I” next line “CGB 23 M.A. 25X50. 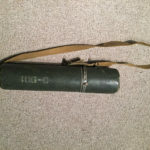 Carrying case for Telescope, Observing, Sniper’s C MK. I made by Research Enterprises Limited in Ontario Canada, 1945. Sealed for carrying. Exterior of the lid of the carrying case for Telescope, Observing, Sniper’s C MK. I made by Research Enterprises Limited in Ontario Canada, 1945. 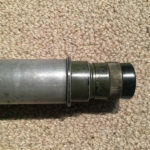 The butterfly lever is used to pressure seal the container to protect the scope from moisture etc. 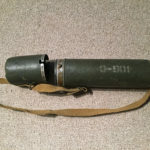 Carrying case for Telescope, Observing, Sniper’s C MK. I made by Research Enterprises Limited in Ontario Canada, 1945. 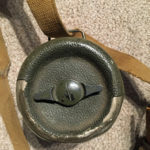 Cap detached. 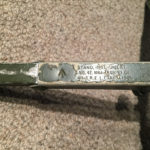 Markings stamped on the rim of the lid of the carrying case for Telescope, Observing, Sniper’s C MK. 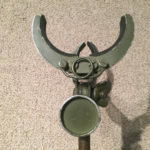 I made by Research Enterprises Limited in Ontario, Canada “1945 R.E.L. / CANADA” and on lower line “1945 483-C” The white tape has my collection accession number on it. 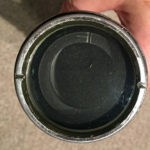 Inside the lid of the carrying case for Telescope, Observing, Sniper’s C MK. I made by Research Enterprises Limited in Ontario Canada, 1945. 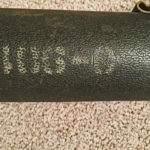 Serial number 406-C painted on the outside of the carrying case for Telescope, Observing, Sniper’s C MK. I made by Research Enterprises Limited in Ontario Canada, 1945. 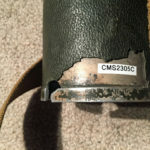 This case is actually stamped serial number 483-C.
Markings stamped on the rim of the lid of the carrying case for Telescope, Observing, Sniper’s C MK. 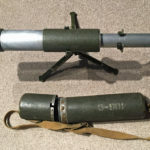 I made by Research Enterprises Limited in Ontario, Canada Marked “CASE, TELESCOPE, OBSERVING, SNIPER’S” and on next line “CGS 197A”. Inside the body of the carrying case for Telescope, Observing, Sniper’s C MK. I made by Research Enterprises Limited in Ontario Canada, 1945. 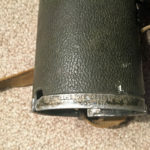 Bottom end of carrying case showing the buckle for attaching the carrying strap. Later manufacture stand C No. 47 MK. I MODIFIED. 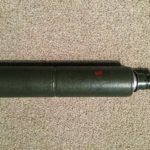 This one was made by Canadian Arsenals Limited and does not have a date, serial number or /| issue mark. The factory paint is also much a lighter colour. No. 47 Stand, Instrument, MK. I for the Telescope, Observing, Sniper’s C MK. I made by Research Enterprises Limited in Ontario, Canada. Stand, Instrument C No. 47 MK. I made by R.E.L. 1945. Serial number 411-C. Stand, Instrument, C No. 47 MK. 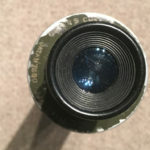 I 1945 SN 411-C with the knob on the bottom of the centre post loosened and the centre post opened up and hinged. It could arc approximately 180 degrees. There does not appear to be any way to stabilize it, so the purpose of this feature is unknown. The feature is not on the undated and unnumbered light green example. Stand, Instrument C No. 47 MK. I made by R.E.L. 1945. No serial number. Stand, Instrument C No. 47 MK. I made by R.E.L. 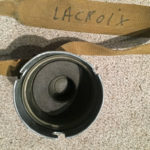 This undated and unnumbered one does NOT have the knob on the bottom of the centre post, and the opening joint sealed. Stand, Instrument C No. 47 MK. I made by R.E.L. 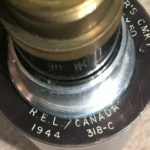 This 1945 example serial number 411-C has the knob on the bottom of the centre post, and the opening joint is operational/ . Stands, Instrument C No. 47 MK. I made by R.E.L. 1945. 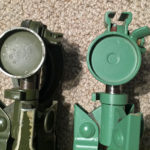 On left 1945 dated example serial number 411-C. On right in light green, no serial number. 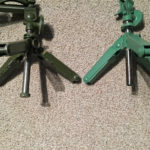 Note that the one on the right does NOT have the knob on the bottom of the centre post, and the opening joint sealed. 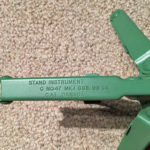 “STAND INSTRUMENT / C NO. 47 MK. I CGB. 99 GA. / C.A.L. CANADA” Canadian Arsenals Limited was set up in 1946 to replace Small Arms Limited, also at Long Branch, Toronto, Ontario, Canada. This stand is not dated but would almost certainly be 1946. There is no issue mark. Note that the maker is C.A.L. not R.E.L. Telescope, Observing, Sniper’s C MK. I – A 25 power (25X) single draw telescope. Short, compact and weather resistant. Instrument Stand C No. 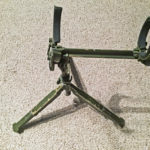 47 – A extremely lightweight and compact folding stand (tripod) that was of brilliant design. 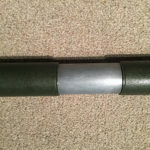 Case – Cylindrical aluminum covered with khaki (green) Vinylite. Neoprene sponge rubber inserts at each end. Carrying bag for the stand – The bag is extremely rare, perhaps because the stand fits into the pocket of a Denison smock and thus the bag was unnecessary. The bag was marked “CASE, C. NO. 47 INST. STAND / C. MK. I CGB 4920” The CGB 4920 was the stores part number. “Without Warning” (Second Edition 2014) by Clive Law shows such a bag on page 49. I am looking for one of these canvas bags. Official Canadian records in the Library and Archives Canada indicate that 500 TOS C MK. I were made, however several have turned up with serial numbers in the 500s. 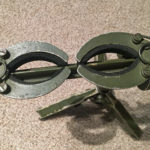 It was thought that they were made too late to serve overseas in World War II but one set has turned up, reportedly having been given to a Dutch family at the end of the war. Interestingly, although the British refused the TOS C MK. I, a fair number have turned up in the U.K. Whether this was due to military procurement or private and/or club purchases of surplus scopes is not known at this time. 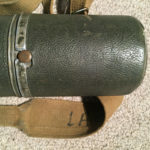 The scopes observed so far are all dated 1944. 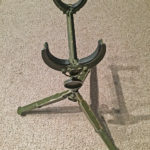 The stands are usually dated 1945, and painted a dark army green although one undated one in apparently original lime green paint is in the author’s collection. The components usually each have a serial number but it seems from observation of surviving examples, that there was little if any attempt to keep numbered sets together and all sets seen so far are mismatched. As a result, collectors should not devalue a set because of mismatched numbers, however if a matched set turned up, then a collector could ask a premium. The terminology below is unofficial as no official instructions have been found. On the stand, loosen the wing-nut (butterfly-nut) and rotate the cradle about 90 degrees, then tighten the wing-nut. Fold the three legs out until they stop. 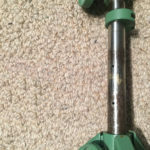 Loosen the smaller round tightening knob, extend the centre pole and then tighten the knob again when it is at the height desired. 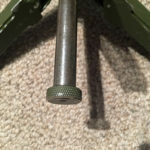 The centre pole has a stopping knurled knob at the bottom. 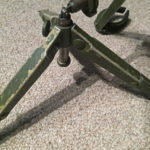 Fold out the lower halves on the tripod legs. This might be optional, but it is recommended for stability. On the cradle, fold each set of cradle claws 90 degrees until each one is vertical. Spread the cradle claws open. There is a stop collar on the centre pole. It is loosened by prying the lever away from the centre pole, at which point the collar will slide. Locking it in position is accomplished by pushing the lever in. An observer could thus set it at a predetermined position for quick set-up according to his size and tastes. 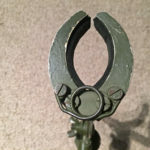 On the case, loosen the wing-nut if necessary to break the seal, then push the lid down slightly and turn counter-clockwise a fraction of an inch to disengage the three “bayonet” style lugs and lift off the lid. 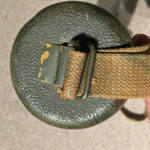 The cap is tethered to the case by the carrying strap. 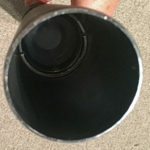 Carefully remove the telescope to avoid damage. In a combat situation, an observer would be careful not to let the lens reflect light which could give away his position to enemy snipers. 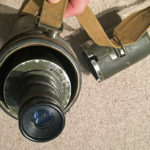 Note that the scope goes into the case Objective Lens (big end) first which is the opposite direction for the British Scout Regiment Telescope. 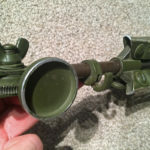 Extend the sun shade on the Objective Lens end of the scope. This helps to protect the les from dirt and scratches and in combat, helps to prevent the give-away reflection. Extend the small end of the scope. 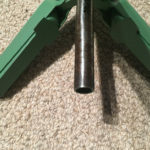 Lay the scope on the stand’s cradle, balancing the weight, and then push the claw clamps against the scope to secure it. 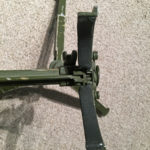 Adjust the stand and scope to suit. 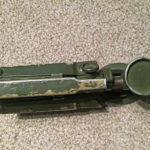 The scope may now be easily elevated or depressed by using the large knurled knob on the stand. .
Focus using the knurled ring next to the Bakelite (black “plastic”) eyepiece. Putting it away is the reverse of the above. Note that R.E.L. 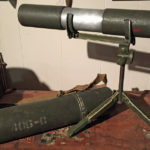 made many other optics including binoculars, artillery sights, naval gun sights and telescopes that look a lot like the classic British Scout Regiment Telescope MK. IIs. I do not know if these were ever used by snipers but it is certainly possible. The Quartermaster issuing scopes did not care what model of telescope he was issuing, as long as it did the job. How many were made? 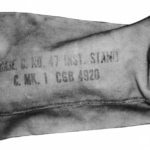 The official records say only 500 but serial numbers of some surviving examples are over 500. Did production continue post-WWII? 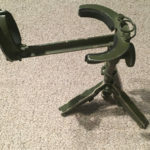 I have one stand (missing the cradle) made by Canadian Arsenals Limited (CAL), after the name change from Small Arms Limited (SAL), with no date, no serial number, no /|\ and light green paint. Why does at least one stand not have a date? Why is the author’s complete stand marked with the British /|\ and not the Canadian C/|\ when the British apparently rejected the design? Stand, Instrument C No. 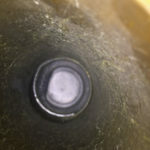 47 – If the knurled knob on the bottom of the centre pole is loosened, the centre pole begins to separate 3-1/8 inches from the bottom. The centre pole can then be pivoted in an arc of 180 degrees. The purpose of this is unknown as there does not appear to be any way to secure it. This feature may be related to the assembly process. It is not present on the post-war unnumbered example.